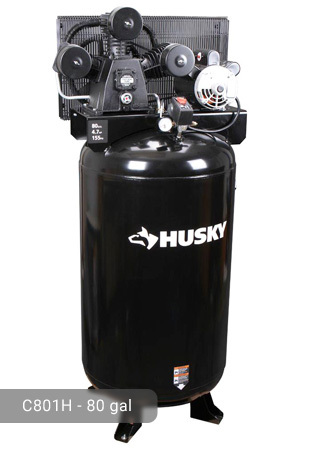 If you need an air compressor that has one of the tanks with the highest storage capacity in the market, you are probably referring to Husky 120 Gallon Air Compressor. 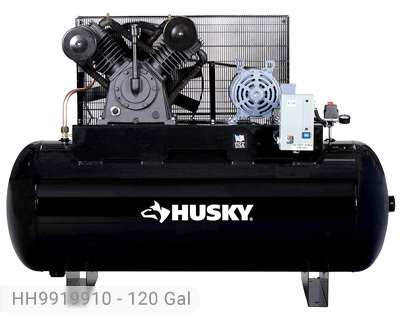 Yes, it has a total capacity of 120 gallons which can provide a longer run time for multiple tools simultaneously. If low tank capacity models do not work for your needs, maybe it is time to invest on this one. 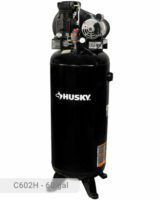 Husky 120 Gal Electric Stationary Air Compressor can generate up to 33.6 CFM of air at 175 psi and up to 35 CFM at 100 psi. These rates are only possible with huge reservoirs such as the one that is featured in this model. The 3-phase motor can provide a power output of 10 HP. It is already equipped with a pre-wired and mounted magnetic starter to help you save time and money. Very convenient, right? Because of its power and high air delivery level, it can perform almost all light and heavy-duty tasks such as the following: grinding, roof nailing, sanding, cutting, drilling, finish nailing, air blowing, spraying, and surface preparations. Since it is expected to heat up quickly because of its heavy-duty applications, the metal belt guard that is installed in this model can cool the 2-stage pump by up to 60 degrees Fahrenheit. Also, the pump itself can run at a cooler temperature because of its cast iron and industrial patented design. No need to stop the machine’s operations every once in a while for fear of overheating. The pump is oil-lubricated because it needs to be durable enough for its intended applications. Oil changes need to be done immediately as necessary to keep the parts running smoothly. Because its tank has a huge storage capacity, expect that it operates loudly with sounds reaching up to 90 decibels. Nevertheless, you will not get annoyed because its efficiency totally makes up for its loudness. The tank, made of steel, is ASME certified so its quality is guaranteed. 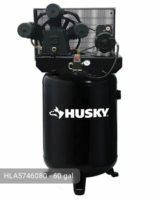 Needless to say, this Husky 120 gal air compressor is not portable because of its huge tank. It is very heavy, weighing 920 lbs. It was meant to be stationary so make sure that you place it on a good and dry location where it can stay for a long period of time. The tank has a horizontal orientation and has 2 feet which makes it easy to mount on a flat surface. To start running the machine, you need a 240-volt power outlet. 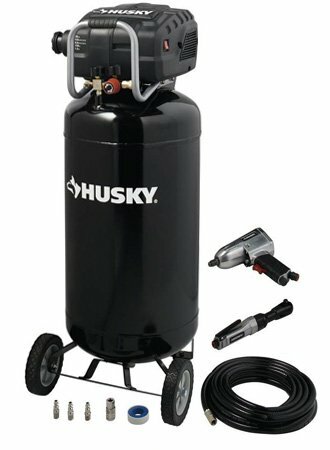 Husky 120 Gal. 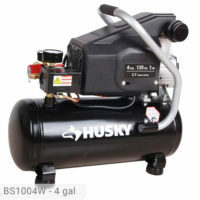 Electric Stationary Air Compressor is perfect both for garage and industrial purposes. It can be used in your automotive shop where tasks are intensively heavy. You will surely finish your work faster because it can power multiple pneumatic tools at one time. At an affordable cost of $2,649.00, you will find it easy to perform tasks which are stressful to do before. 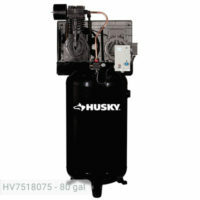 Other brands do not offer the compressor tank capacity that this model has so make sure that you grab the chance to get this high-quality Husky 120 gal air compressor. If you already own Husky HH9919910 model or just want to buy it, feel free to share your review or ask a question through the form below.